Every structure that is added on the Greek coastal landscape has a cultural impact on the experience of the traveler. For this reason, responding to the architectural competition for the design of a pilot beach bar, changing facilities and lifeguard tower for the region of Dodecanese in Greece, we introduce a holistic approach for the design of the beach equipment with a high contemporary aesthetic influenced by the timeless character of the place, that addresses both the visitor and the local population. The architectural proposal for the beach equipment is influenced, on one hand, by seminal projects that have characterized the Greek seascape, and, on the other hand, by the ever-changing morphology of each coastal landscape. During the 60s, well-known architects have been asked to provide an identity to the life of the city of Athens near the sea: in works such as the complex of Asteras Vouliagmenis by Vassiliadis, Sakellarios and Vourekas, wooden structures coexist with more heavy volumes. These lightweight structures have been the background of the bathing experience and act as our main iconic reference. 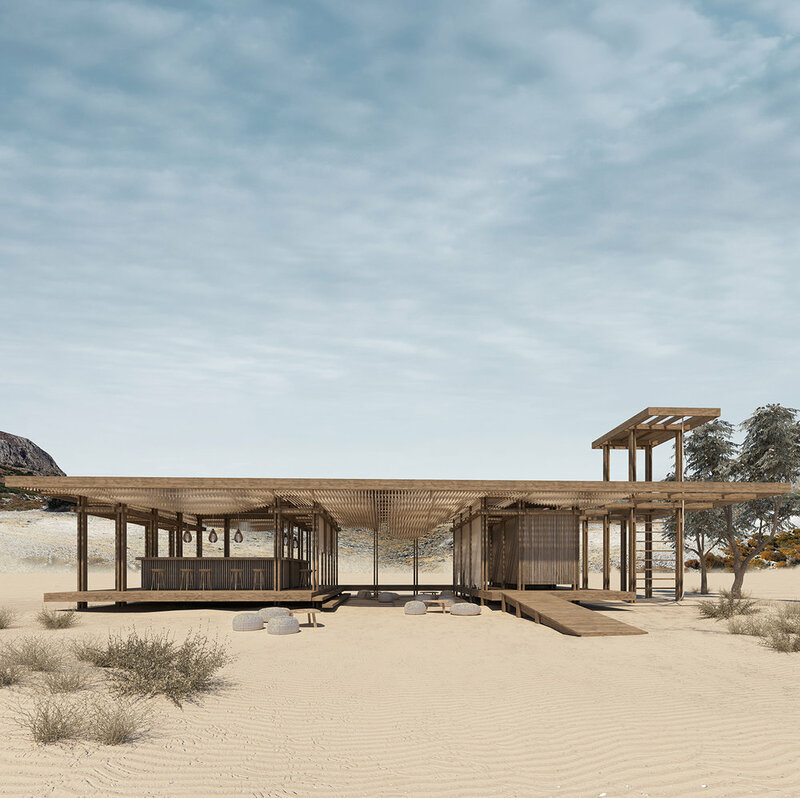 Beyond the morphology of the wooden structure, the proposal is influenced by the specific needs of the site: given that each beach bears unique natural characteristic such as the length, the width, the topography, we believe that the proposal should be able to adapt to these variable circumstances.The proposal is based on a flexible scheme where the individual objects of the beach bar, the lifeguard tower, the changing rooms and the shower can either function as stand-alone elements to be installed upon choice and needs, or they can be integrated under a common roof, a common “shelter” creating a landmark for each beach operating as a whole unit.